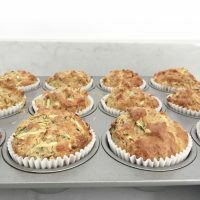 These cheese and courgette muffins are a great grab-and-go snack. And are a great way to use a glut of courgettes (zucchini) in the summer months. I often pop one of these in my boys’ lunchbox along with some veggie sticks and a flask of soup when we’re going swimming after school and will be eating on the run. They’re also lovely with wedges of frittata for an easy picnic. Just use them whenever you’d use bread – they’re great served with soup or split and toasted with eggs for brunch. 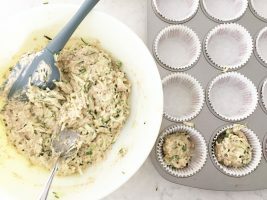 They are an easy thing to make with small children and don’t require any machinery, just a grater, bowl, spoon and muffin tin. Perfect for the weekend or school holidays. They do stick a bit to the paper muffin cases but my boys love picking them off and it keeps them busy for a while so I don’t stress about it! They freeze brilliantly, just defrost them and pop them in the oven for 5 minutes to refresh them and crisp them up again. Or grab one from the freezer in the morning, throw it in a lunchbox and it will be defrosted by lunchtime. If your children are green-phobes, you could peel the courgette first to make it totally hidden. 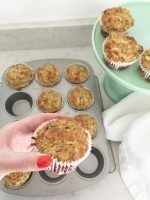 The courgette serves not only to add fiber and vitamins but also to moisten and bulk out the muffins and replace the butter that is traditionally included in them. Heat the oven to 180°C (350°F) and put papers in a 12 hole muffin pan. If you don’t have muffin papers you can use squares of parchment paper, pushed into the pan. Put the pancetta into a frying pan and cook for 5-10 minutes until crisp and the fat is released. Or skip this stage if you’re not using pancetta. 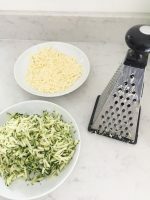 Coarsely grate courgette onto a plate and then grate the cheese onto a second plate. Finely chop the spring onions using all the green and white parts. Set aside. Mix the flour and baking powder together in a large bowl, use a whisk to blend them thoroughly. Add the cheese to the flour along with a generous amount (a quarter teaspoon) of black pepper and a pinch of salt. In a large measuring jug, whisk the milk and eggs until combined. Stir the eggs and milk into the flour mixture until combined before folding in the pancetta, courgette and onion. The mixture will be stiffer than most cake batters. Divide the mixture between the 12 muffin cases, it will fill the cases. Then bake for 25-30 minutes until the muffins are risen and golden and are firm but springy to the touch. Leave to cool before serving, leftovers can be frozen or kept in an airtight container for up to 3 days. Refresh them in the oven for a few minutes before serving to help the cheese melt a little again and make them moist. 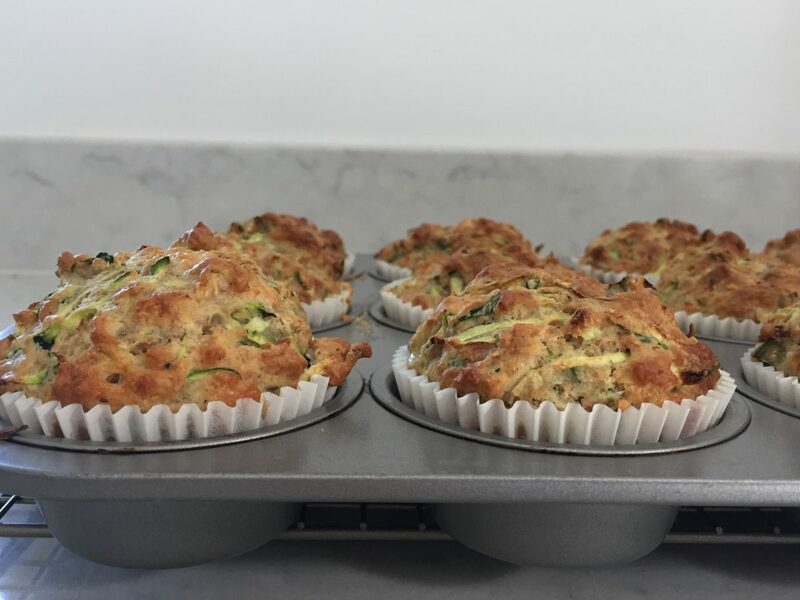 Find more recipes for baking, courgettes and cooking with kids here.